16th century onwards. Pews did not appear in churches until after the Tudor Reformation. Sermons from this time became longer and so seats were needed for the congregation. The bible rests upon the lectern for reading during the church service. 14th century onwards. Pulpits, from which the sermon is delivered to the congregation, were introduced in about the 14th century. The font is usually placed just inside the entrance to the church near the start of the central aisle. The aisle represents the Christian’s journey through life towards God and so the baptismal font is placed symbolically at the start of the journey. Medieval sundials were once commonly found on the walls of churches. They were fixed vertically onto the wall and the gnomen cast a shadow onto the dial to indicate the hours of the day. This is where the Eucharist or Holy Communion takes place. Usually the altar table is covered with a cloth. 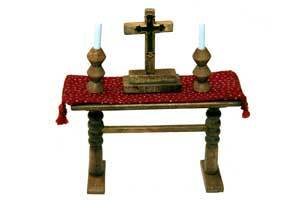 A plain cross is generally kept in the middle of the altar with tall candles on either side.